For many artists, it is almost natural that after making four great studio albums that they put out a live album. That’s exactly what Pat Benatar did in 1983 with “Live From Earth.” All of the great classics from her previous albums are all on here and all are done with such intensity, it has left me regretting the fact that I have never seen her live. Listening to the album and viewing some of the concert footage on YouTube, I know Pat would have been amazing. 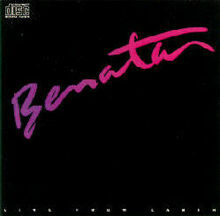 If any of you at there have seen Pat Benatar in concert, I would love to read about your experiences. “Live From Earth” was recorded in California and France during her sold out tour for the “Get Nervous” album and has the two tracks “I Want Out” and “Looking For a Stranger” and both sound fantastic live. The strange phenomena is the fact that the two best known tracks “Shadows of the Night” and “Anxiety” are absent on the record, although they both appear on the VHS version released two years later. Still, those tracks not being there doesn’t spoil the rest of the record. I mean how could it with such great Benatar classics like “Heartbreaker,” “Hit Me With Your Best Shot,” “Fire and Ice,” need I go on? In spite of “Live From Earth” being a great hard rocking live album, some have pointed to it as the turning point for her move away from the heavy rock albums that made her the queen of rock from 1980-2. I’m talking about the single “Love is a Battlefield.” To be honest, I’ve never hated this song but is completely different from what I had heard from her in the past. It is definitely a typical 1980s synthesizer pop song in some respects but with Pat’s voice, I found it impossible to dislike. The question remains: Did “Live From Earth” mark the turning point for Pat Benatar from being a feisty hard rocking rock queen to a trendy top 40 performer? Possibly but after listening to this incredible live album, I don’t really care. I just prefer to sit back and hear all the great Benatar rock classics played so well live and have a small regret of never having been to one of these concerts. This entry was posted on June 13, 2016 at 8:05 am and is filed under 1980s, Concerts, Music, Rock, Uncategorized with tags Classic Rock, Get Nervous, hard rock, Heavy Rock, live albums, Live From Earth, Pat Benatar, The 1980s, Youtube. You can follow any responses to this entry through the RSS 2.0 feed. You can leave a response, or trackback from your own site. Nice review! My buddy had this album but it’s been 3 decades since I heard it ! Haha…how is the production on it? Thanks, the production sounds okay to me. Maybe “Love is a Battlefield” is the result of how MTV was starting to change the music world and more artists were figuring out that music videos with the new “80’s” sound was going to make you more green backs? You are right about it being a great record too. You’re more than likely right about MTV and music videos.